Scrappymags 3-word review: Beachy thrills abound! Shortest summary ever: Cass might be cracking up. She swears she hears and sees strange things yet no one believes her. It starts with a drive home after a party when she sees a lone woman sitting in her car on a deserted road. The next day she finds out the woman was murdered… IS Cass imagining the things causing the hairs on the back of her neck to stand up, the feeling of being watched and maybe even stalked? Is it all in her head? Or is she right after all? What’s good under the hood: Either I watch too much ID Discovery Channel (entirely possible) or this is a predictable book, but despite that I enjoyed watching the mystery unfold. I read this book in about a day and a half which is quick for me. I particularly love the ending… no spoilers! 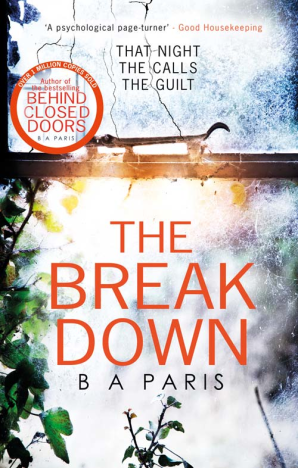 I read Paris’s previous novel Behind Closed Doors and felt the same about the plot of The Breakdown – it’s friggin’ awesome. Paris gives good story. The threads she creates are unique, intriguing beyond belief, hence why I can suspend some disbelief (I sort of don’t care with a story this good). At first I was mega-annoyed by Cass in a slap-her-she’s-so-weak way, but as a person with anxiety issues I related to her feelings of panic, fight or flight responses etc. as sometimes your body goes into flight mode over triggers. For instance, I would move to open a door and could not open it, feeling like I would die if I opened the door. I knew it was irrational, but couldn’t help that response. 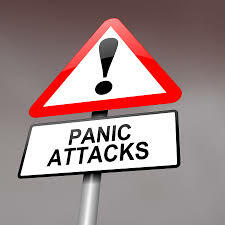 Panic/panic attacks are terrifying if you’ve never experienced it. You feel as if you are dying – literally dying, while your brain acknowledges this is irrational, you still FEEL that way and are powerless to make it stop. Worst feeling. While some may criticize Cass, personally I could feel that response as I’ve had it before. It’s the heart of panic attacks. It’s irrational. You know it’s irrational but you don’t control it, and that frightens you even more. That psychological aspect of the book was spot on. What’s bad or made me mad: The mystery was too easy to figure out. More characters and developing them further might make the mystery less easy to see. I figured it out at 16%, making a note of some way-too-obvious foreshadowing. But heck, you see who does it in Columbo episodes rfrom the start and it’s still interesting to watch the investigation unfold. Best seller mystery readers. My peeps. Avoid if: You can’t hang with a book you’ll figure out too soon. Thanks to NetGalley, St. Martin’s Press and the author for an advanced copy in exchange for an honest review and some heavy duty bags under my eyes from late night can’t-put-this-down reading. This entry was posted in book review, Books and tagged B.A. Paris, book, book review, books, fiction, literature, mystery, psychological thriller, reading, reviews, thriller.